The hoops that black women have to jump through if they want to achieve the straight hair look are lost on most other races, and when heat or chemicals are involved, it can even lead to hair loss. Given Afro hair is naturally more brittle than other hair types, it can be easier for the hair to become damaged. There are several ways in which this can happen, including extreme heat styling, chemical relaxers and also hair extensions. These can lead to hair breakage, chemical trauma, and also a hair loss condition named Traction Alopecia, something which can also happen when “tight” styles like cornrows are worn for prolonged periods. Either through choice or through societal pressure, countless black women straighten their natural kinks and curls, but the price they pay in terms of damaged hair and hairloss is gathering an ever-growing collection of column inches. Unsurprisingly, perhaps, a “natural hair” movement is rapidly gathering steam, with advocates including Beyoncé’s sister Solange Knowles and actresses Lupita Nyong’o and Viola Davis. This has received a massive boost following the record-breaking blockbuster movie Black Panther, which features a largely black cast who all sport natural hair styles. New York magazine has reported that the popularity of salons dedicated to extensions and chemically-treated hair have been experiencing lower sales. Because of this trend, tutorials are springing up all over the internet aimed at helping women with Afro hair to change up their look with less punishing methods than they have traditionally been used to, and one of the most popular is known as African Threading. This styling method is currently being promoted by Essence magazine, an esteemed US publication aimed at the female African American community, in order to help its readers to better protect their hair. It claims stars including Beyonce and Erykah Badu are fans of African Threading. Whilst the method still applies tension to the hair, it’s certainly preferable to heat or chemical relaxers. It is recommended by hairdressers that it is carried out on damp hair, not wet, as wet hair is more fragile, especially when the hair is damaged. Afro hair is already the most naturally porous of all hair types. Above is one of the most watched videos on YouTube about African Threading – a semi-tutorial from the vlogger NaturallyPhilo who has been wearing her hair naturally for three years now. YouTuber Tasha Frost also does a good job of explaining the process in a video on her channel entitled “Natural Hair: Stretching Out Shrinkage Without The Heat/Threading Method”, and advocates going to bed with the threads in to allow maximum time for the straightening process. The downside of the video, perhaps, is that it does illustrate how laborious the process is. Unfortunately, the risks posed by extreme styling are only too real, prompting researchers at John’s Hopkins University to issue a warning about how dangerous some methods are. 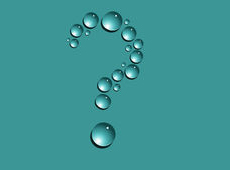 Chemical treatments such as relaxers can cause temporary shedding if the strands become brittle and break away from the root or along the shaft. What becomes more alarming is when what is known as chemical trauma becomes an issue: this happens when the follicles become sufficiently damaged by the chemicals that they cause burns to the scalp. When these are severe enough to harm the follicles, hair loss – which may well be permanent – ensues. Likewise, heat styling is a serious concern – especially when some of today’s straighteners can reach up to 450 degrees, a temperature high enough to melt hair. While the breakage it can cause – whereby the hair snaps in two along the shaft – is not a hair loss condition as such, it can still leave hair looking thin, dull and lifeless. The hairloss condition most often seen when people repeatedly wear tight hairstyles such as braids or extensions is called Traction Alopecia, and is the result of too much stress being placed on the hair follicles. In simple terms, wearing a very tight style can actually damage the follicles around the areas of increased tension – usually the hairline and any strained areas where the styles are fixed to the scalp. This tends to result in hair loss in these locations, which often presents as a receding hairline or thinning edges, and thinning hair or bald patches around strained areas. 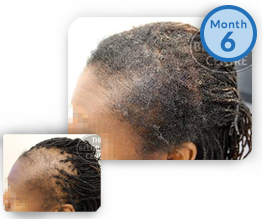 In cases of Traction Alopecia – which is fully preventable – the hair loss may be permanent if not caught in time. This is why it is important to be mindful of any changes to the hair or signs such as tension headaches, when using these styling practices. If it is suspected, the first thing to do is to remove the risky hairstyle and wear the hair naturally so that the follicles can recuperate. In mild cases, given sufficient rest, normal hair growth may resume naturally over time. 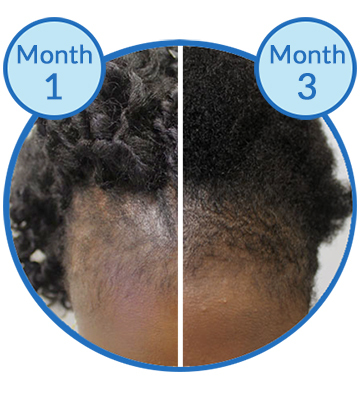 Belgravia offers clients experiencing this condition personalised Traction Alopecia treatment courses tailored to their level and pattern of shedding. The clinics’ experts have found that using applications of appropriate high strength minoxidil formulations from those available at the clinics’ in-house pharmacies can be beneficial in promoting hair growth in both male and female clients of all races. This topical drug is often paired with additional hair growth booster products, which range from low-level laser therapy (LLLT) to highly-targeted food supplements, such as Hair Vitalics for Women. Although LLLT devices, such as the LaserComb and the LaserBand have not been tested on people with darker skin tones, there has been positive feedback from clients with Afro hair and the company explains that the reason for not testing on people with darker skin or pale skin and light hair, is due to the results being easier to monitor during clinical research in people with more of a contrast between their hair and skin colours. Both of Belgravia’s Central London clinics are stocked with products, shampoos and conditioners suitable for Afro hair, and clients are also often offered the highly-targeted nutritional supplement Hair Vitalics, which – thanks to its proprietary blend of vitamins, minerals, amino acids and botanical extracts, including selenium, biotin and zinc – can help to maintain healthy hair growth. Do Belgravia's Hair Loss Treatments Work As Well for Afro Hair? The world's largest collection of hair loss treatment success stories, with photos and comments from patients who are using our custom courses.